What Is DA Form 759-1? DA Form 759-1, Individual Flight Record and Flight Certificate - Army (Aircraft Closeout) is a form used for recording flight time by flying duty and condition for each aircraft or flight simulator during the closeout period. DA 759-1 forms are prepared only for the aircraft flown during the period covered. The most recent DA Form 759-1 fillable version is available for download below or can be found online on the Army Publishing Directorate website. The latest edition of the form was released by the Department of the Army (DA) in July 2018 with all previous editions being obsolete. A separate copy of the form is generated by the Centralized Aviation Flight Records System (CAFRS) for each aircraft and simulator listed on the soldier's consolidation worksheet. A separate DA Form 759-1 is prepared for each flight simulator and aircraft for every UAS operator and flight surgeon on the soldier's DA Form 759-3 (used as a consolidation worksheet). How To Fill Out Da Form 759-1? Block 1 should contain the chronological sheet number. The name, rank and period required in Blocks 2 through 4 are copied from Blocks 1 through 3 of the DA Form 759-1. Block 5 is for identifying the aircraft mission, design, type, and series of a flight simulator, and, if applicable, the seat designation. Blocks 6 through 12, Columns A through J are for the total amount of hours - in hours and tenths of hours - for all like entries on the DA 759-2 according to flying duty and flight conditions symbols. Column K is reserved for the total amount of hours across lines 6 through 12 for each flight condition. Column L requires the sheet number of the previous DA 759-1 at the top and the totals from Column M of the previous DA 759-1 for the same aircraft mission, seat designation, design, type and series of a flight simulator. Column M requires the new totals from adding the numbers in Column K and L on lines 6 through 12. The hours in Column M are added together and the result is recorded on line 15. The sheet number specified in Column L is entered in Block 14 followed by the totals from line 15 of the previous DA Form 759-1 in the corresponding columns on this line. Block 15 requires the sum of lines 13 and 14 with the totals entered in hours and tenths of hours. Block 16, Columns A through J are completed according to the corresponding consolidated DA Form 759-2. Line 17, Columns A through J is for the imminent danger hours according to the information from the corresponding DA Form 759-2. DA Form 759, Individual Flight Record and Flight Crew Certificate-Army (Flight Hours) is an Army form used to close out flight records. 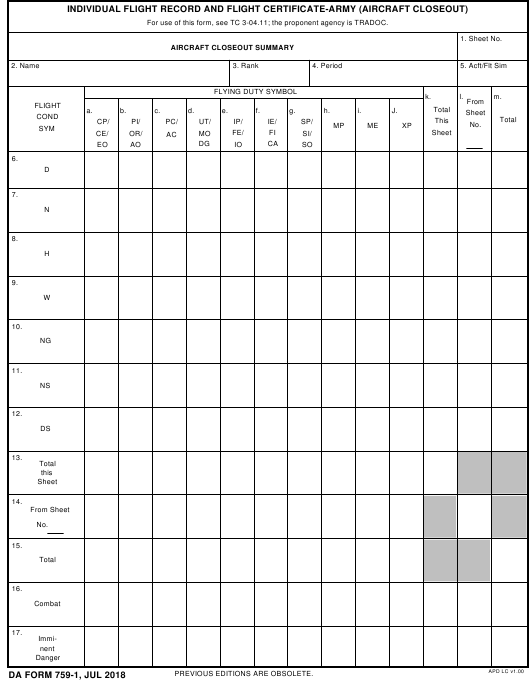 DA Form 759-2, Individual Flight Records and Flight Certificate-Army (Flying Hours Work Sheet) serves as a record of an aviator's flight hours and is used as a temporary worksheet or a consolidation worksheet. DA Form 759-3, Individual Flight Records and Flight Certificate-Army (Flight Pay Work Sheet) is a form used to keep individuals flight records in order to set flight pay. 5. At closeout, flight record forms are arranged in the DA Form 3513, Individual Flight Records Folder, United States Army.